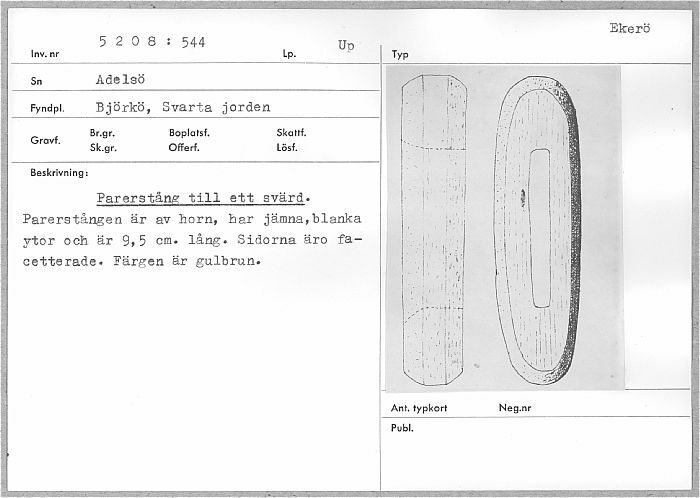 Forum Index > Historical Arms Talk > Bone Cross-Guards on original Viking Swords. Posted: Thu 10 May, 2007 3:06 am Post subject: Bone Cross-Guards on original Viking Swords. I certinally am no Viking sword expert but, having recieved a copy of the "Viking Warrior " Osprey today I was amazed to see an original bone sword cross guard from the British museum. Apparently they are mentioned in......." the Laxdaela Saga ". I have posted the pic for those who havent see one before but I am wondering if anyone has any other pics of the other side or any drawings of the detail....or if there are any other bone cross-guards kicking around in museums anywhere as some of you have traveled a lot more than I have. Mabye Elling Polden has seen some being in Norway ? Cheers and best wishes to all. Thank you for that image! I know there are various more examples in the Museum of London. Unfortunately though, you're not allowed to take photos there, and I have no idea whether they're published somewhere. I haven't run across much bone sword furniture in my research. By the look of it, that is late style carving, 11th century perhaps. 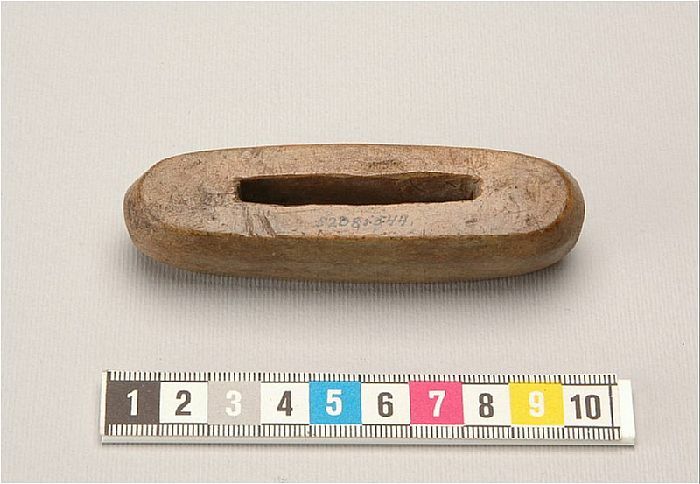 There is a pommel at the Yorkshire Museum dated in the viking era as well. Last time I was at the Museum of London pictures were permitted in all but a few of the special temporary exhibits. As far as I know it is still permitted. I was surprised when I discovered this comment of the picture in "Viking Hersir" published by Osprey. 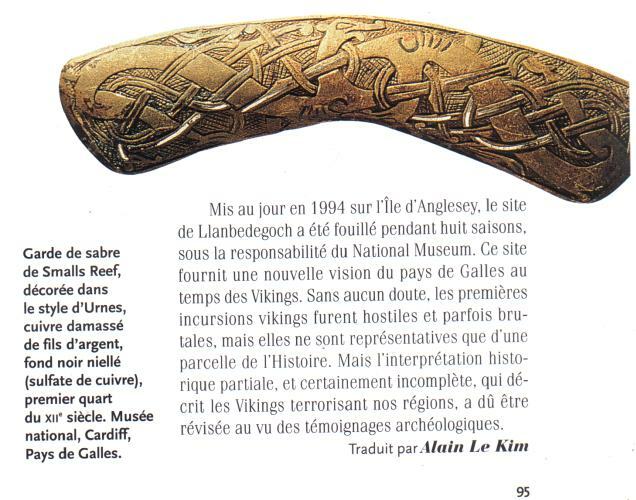 I have a picture in colors in another book (in french) describing the cross guard being made of copper inlaid with silver wires and niello in the background. This book says that this guard is in the National Museum of Cardiff, Wales. Hi Jean........... Thanks for that information and pic....very interresting..............its very hard to tell from a black and white pic of course, but I'm sure that wouldnt be the only item that Osprey has gotten wrong although I am sure they take care to try and get it right. There are a few other verified fittings in bone and antler but they are hard to find. Here is a Viking sword with a bone pommel and guard. The image is from "Das Reichsschwert" by M. Schulze-Dorrlamm. (The wire grip looks like a much later addition). Very interesting, any other information regarding this one ? Period ? Place of find....Museum ? Not much info as far as I can tell... However I can not read German. The caption says "Schwert des hl. Stephan (Knauf und Parierstange aus Bein) Prag, Domschatz." I took this to mean that the pommel and guard were of bone and I think that the other may be the location. "oder bei dem Schwert des hl. Stephen im Prager Domschatz sowie bei den mit Tierornamenten im Jellingesteil verzierten Wikingerschwertern des 10. Jahrhunderts aus Busdorf, Vesterhaug und London oder auch bei einem Schwert mit Scheibenknauf des spaten 12. Jahrhunderts im Musee de l' Armee zu Paris." I took it to mean they are calling it a Viking Sword with Jelling style decoration. For the rest, maybe some of our German speaking forumites could help. "Sword of St. Stephan(pommel and cross made of bone), Prague, Domschatz. 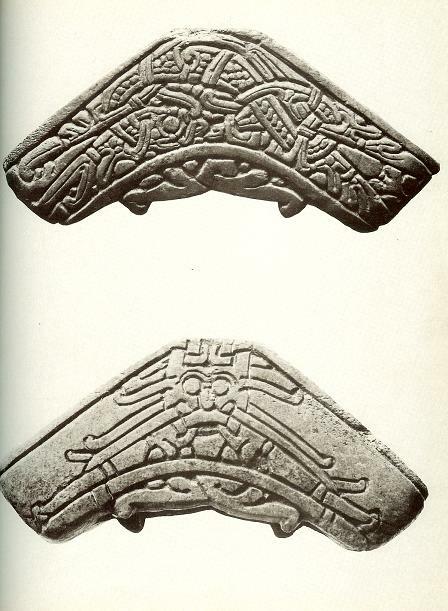 The text mentions the depicted sword, and tells us that there are viking swords from Busdorf, Vesterhaug and London, from the 10th century, that have Jellinge-style ornaments. And something about a sword with a disk pommel from the late 12th century from the Musee de l'Armee in Paris. Whether the other swords have bone pommels/guards is diffuclt to say without the rest of the sentence. I have read a few about this sword in the past. It is related to Stephan the First, also known as St. Stephan, who was the first hungarian king. He was crowned around 975, so the sword was probably made that time. According to a book (sorry, I forgot the title and author, and it was hungarian anyway), the blade is one of the famous Ulfbrecht makings. It was traded and hilted in etiher Hungary or somewhere in Scandinavia in the local fashion. The whole sword was clearly an exquisite piece in the age of its birth. The blade being forged by one of the top smiths of the era and the carefully carved hilt (which has unfortunately worn out through the ages) makes it truly a king's weapon. Sorry for hijacking the thread, but this sword is the second most famous in my country, and one of my favourites. Hope this helps. Very interesting thread, some beautiful weapons and weapon-components. My only comment is a general one. I don't think it is so odd that a Viking or particularly migration-era sword would have a bone -cross, because at this point the sword is much less designed for parrying or displacement, that is done with the shield primarily. Thats why Viking and migration era swords had such minimal cross-guards, almost like asian swords, because the purpose is really to fix the position of your hand (and prevent it from slipping down the blade) and only to a lesser extent, stopping an enemies weapon which might be sliding toward your hand. It's similar to so many Roman swords, including the Spatha types which were similar to migration era swords (even arguably somewhat interchangable) which had wooden, ivory, bone or other organic materials for both ends of the hilt. I'm sure most people on this list are well aware that it wasn't until toward the end of the migration era that you started to have proper iron pommels begin to appear, which affected the balance of the swords and led to the next step in their evolution. At least as I understand it. Actually, there are quite a few early iron age swords with iron pommels of various sorts. Thinking of stuff mostly from western Asia, here. And of course, bronze swords came with (usually integral) pommels of all types and sizes. Thank you everyone for the german text, it's translation, and the story of St Stephan. Nice example of international co-operation. Be interesting if you could elaborate on this with some details. I was speaking within a European context, but I'm interested in early Asian weapons with pommels as well. Perhaps my understanding of the evolution of the European sword is incorrect. The bronze weapons are a bit different in terms of the properties of the metal but I did not know that proper pommels were used on bronze swords. Are they of the same weight relative to the blade weight? All of the bronze 'pommels' I'd seen appeared to be essentially ornamental.. I'd be interested to see some examples of what you are talking about, and to learn (from anybody) how an integral as opposed to peened pommel might affect things like COP. In Manoucher Moshtagh Khorasani's book "Arms and Armor from Iran", he shows and describes several early Iron Age weapons of steel/iron with steel/iron pommels. These pommels are extremely decorative, but of considerable size. They are from Luristan, and date to 1100-1000 BCE. Bronze swords of the approximate same region/period show a variety of pommel shapes and sizes. Most common are the mushroom-shaped and eared pommels. Both styles of a sufficient shape/size to offer a considerable counterbalance to the blade. As a "non-expert" on blade dynamics, i would say that the difference between integral and peened pommels is non-existent----it is all about distribution of mass. If you go back to Oakeshott, he basically claims that the 15th century type XVIII swords are a "modern" analog to the cut-and-thrust weapons of the late iron age. He also claims that the linear evolution apparent in sword form/function is illusory, that swords, indeed, are a unique response to the local/temporal conditions of their historical context. I understand what Oakeshott means by that, and there is some truth in it, but there is also the inescapable fact that there was actually some evolution, simply due to better smelting and forging technologies becomming available. Much longer cutting swords could be made for example. Complex hilts and large quillons appeared. With respect to both you and Mr Oakeshott steel is very different from iron and iron behaves very differently than bronze. The early bronze thrusting swords were VERY different from 15th century swords, many of the bronze 'rapier' type swords had blades welded to the handles! There was no equivalent of two-handed longswords in the bronze age that I'm aware of. It's true that many different types of fullering and blade geometry that you see in the Renaissane were experimented with, particularly by the Celts, but that is a far cry from saying the swords were the same or even necessarily similar. In most cases they definately were not, especially if you are talking about anything other than a short (under 34") cut-thrust sword. And while I'm not an expert on this either I disagree with you that an integral pommel would act the same way on a sword as a peened or even a welded pommel. I'd be interested to read the comments of some other better informed forumites here on that though. How could an integral pommel behave significantly differently than one that was welded or peened on? The distribution of mass would be the same, and the security of attachment would be nearly the same? In essence, a proper hot-peened pommel behaves as if it is as one piece with the blade. I just find it funny that you describe swords with blades less than 34 inches in length as being "short". There is no disrespect intended therein, either. It's just that swords with blades much over 30 inches were used for such a short period . . . . . . . . I sometimes feel that we, as modern users and reconstructionists, have such odd ideas about what a sword should be. I include myself in that group . . . .
Matthew Amt wrote, a few weeks back, that many surviving Roman gladii are a lot like sharpened pieces of metal (that's a misquote and paraphrase, BTW), with no consideration towards "dynamic balance or handling". In my mind, that is what a sword is. A sharpened, pointed piece of metal for inflicting harm on an enemy. I find dynamic handling and "balance" to be highly over-rated when it comes to "short swords". I can't think of any two-handed use "long swords" in the bronze age, either, though there were some found in the Iron Age. Long quillons seem kind of pointless to me, other than as another striking element for the user. Complex hilts? Nice, but not necessary. I would not be one to argue that there was *no* technological development between the Bronze Age and the Medieval period. But I might argue that it is a lot less significant than people might think . . . . . .
Definitely not meaning to be truly argumentative here (tho I love to argue). Like I said, I'm by no means an expert on that, but you might find this article interesting, it made sense to me. You misunderstood me, I'm afraid I wasn't clear. I was referring to 34" in total length, which includes swords made for quite a long period of time, at least a millennia. Matthew is a great researcher, I have corresponded with him before and learned a great deal from him. I would not have any trouble believing this. You might want to consider however that the Romans were literally mass producing swords by the thousands for centuries. Standards across the board declined in the last couple of hundred years of the Empire. So they may have very well been manufacturing very crude weapons indeed. Similar phenomena existed in Europe in the Renaissance, your so called "munitions" armor. Many halberds and bill blades were cranked out which were little more than jagged pieces of metal. None of that however means that finer quality weapons did not exist, nor that the quality didn't make a difference. It did. There is a reason why the Swiss halberds were often tempered steel for example. I can't think of any two-handed use "long swords" in the bronze age, either, though there were some found in the Iron Age. Long quillons seem kind of pointless to me, other than as another striking element for the user. With all due respect, that is because you don't know anything about HEMA. If you understood how these weapons were used, you would understand how critically important they were. Long quillons protect your hand in any number of counters, displacements and other contact with your opponents weapon. Not just in theory, for real, I spar full contact with training weapons every week and like nearly any HEMA sparing weapons, the quillons are hard, in our case made out of metal, so that they will protect our hands sufficiently. If quillons didn't protect your hands I would have a very hard time typing this right now. Every part of a sword was made for a specific purpose, you really don't want to add weight unless there is a compelling reason. The long quillons are there for a very specific reason: you are using the sword itself to defend against attacks, rather than only using a shield. Complex hilts? Nice, but not necessary. Unfortunately, just because a weapon is alleged to be a "close reproduction" doesn't mean it's in fact an accurate one. Most replicas, even the most expensive ones, as little as ten years ago were not even in the ball-park of the historical weapons they were meant to be replicas of, even on paper. Only in the last few years have fairly realistic replicas become widely available, and even now many quite expensive and well marketed swords are really barely worthy of the name. You should investigate how swords were used a bit more so that you can understand what they were, and that in turn will help you understand ancient History much better, it certainly did me .